For the 10th of February we curated something extremely special for you guys. The vinyl master from outer space has made his way to our very distant place on earth, and will enlighten us in unknown and unexpected soundscapes from beyond. 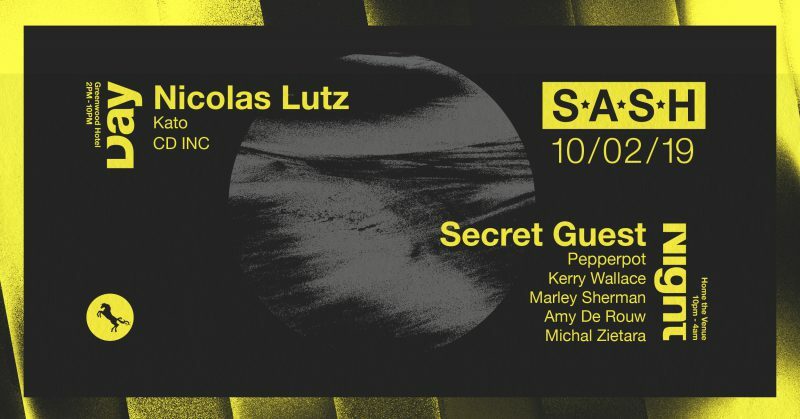 During the day Nicolas Lutz will be taking us on a 4 hour journey in the courtyard of the Greenwood. Kato will be second in command, while CD INC. will be properly starting the engines. This most interesting DJ, originally from Montevideo Uruguay, is maybe most notorious due to his vision on the music scene and the format he solely uses. Nicolas Lutz only plays vinyl, and that is not because of his lack of interest in future technologies. ; it is because of the beauty and artistry of the format. The endless digging in record shops all around the world and with that creating a uniquely owned collection goes beyond playing the music at parties. It’s about finding rare and special gemstones all in their own way, which unexpectedly will come to attention whenever they are ready to be played. After a day of getting lifted up to other dimensions, we’d like to be a bit mysterious about what’s happening at night. Another Secret Guest will be heading the bill at the Terrace, supported by Michal Zietara, here all the way from Germany and having our own Frenchy Pepperpot directing it to the close. In the Den our residents Kerry Wallace and Marley Sherman will be selecting tunes. With some Dutch love in the form of Amy de Rouw on opening duties.